Next-generation sequencing (NGS) is a platform that provide whole-genome sequencing or targeted sequencing (e.g. whole-exome sequencing) for the DNA samples originated from different sample types (e.g. villus, amniotic fluids, cord blood, saliva and peripheral blood) from a fetus/individual. Compared to G-banded chromosome analysis (karyotyping) and chromosomal microarray analysis, it has been demonstrated to have an increased disease diagnostic yield in prenatal and postnatal genetic diagnosis. 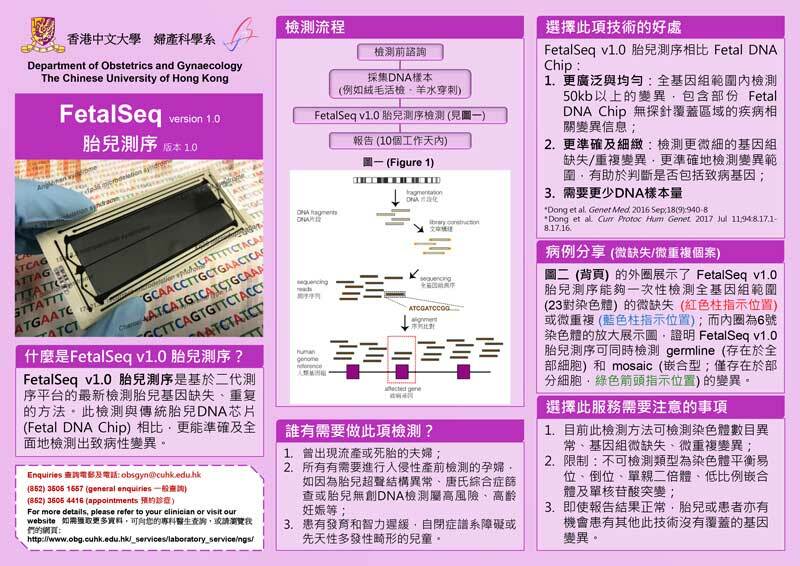 FetalSeq v1.0 is based on low-pass whole-genome sequencing (LP-WGS) for identification of copy-number variants has been developed and validated by the Chinese University of Hong Kong (PMID: 26820068 & 28696555). The test will detect virtually all of the known microdeletion and microduplication syndromes as well as copy number changes greater than 50kb with significant exonic changes in the human genome. 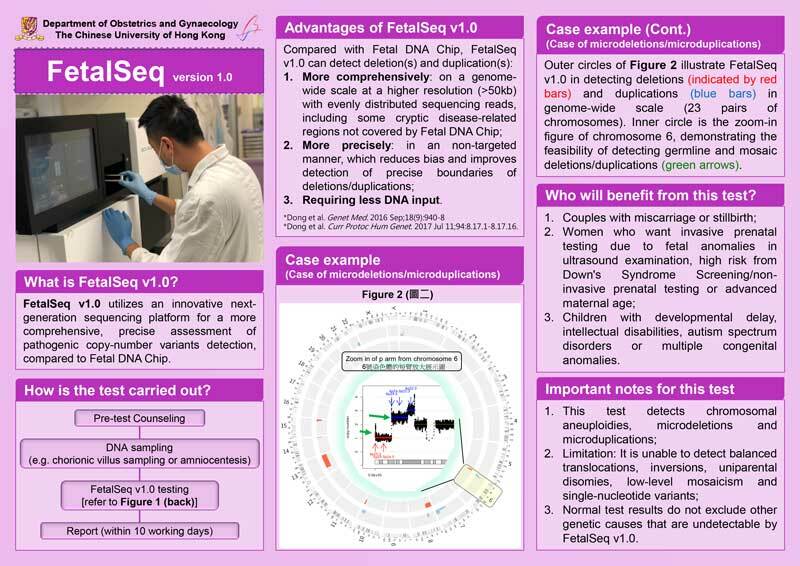 Method: Genomic DNA (50-100ng) obtained from the submitted sample is subjected to non-target-enriched library construction procedure and sequenced in next-generation sequencing platforms including NovaSeq, HiSeq X Ten and BGISeq-500. Unless otherwise indicated, approximately 0.25X or 0.25-fold read-depth (~15 million reads with single-end 50 bp in size) is obtained for each sample. Reads are aligned to a reference sequence (GRCh37/hg 19) by Burrows-Wheeler Alignment tool (BWA) (PMID: 19451168) and classified into sliding windows (50kb with 5kb increment) in terms of the aligned coordinates. After GC-correction and population-based normalization, CNV detection is performed by in-house pipeline (Increment Rate of Coverage) and interpretation is carried out with the publications and online databases according to the guidelines of the American College of Medical Genetics and Genomics. Limitations: This result does not exclude all small chromosome anomalies, copy number polymorphisms, chromosomal rearrangements in the human genome (PMID: 15286789). A normal LP-WGS test result will not totally exclude the possibility of having a specific genetic condition due to triploidy, uniparental disomy, low level mosaicism (<30%), balanced translocation, balanced inversion or point mutation. Figure (above) shows the robustness of FetalSeq v1.0 for detecting deletions (indicated by red bars) and duplications (blue bars) in genome-wide (24-chromosome) scale (outer circles). 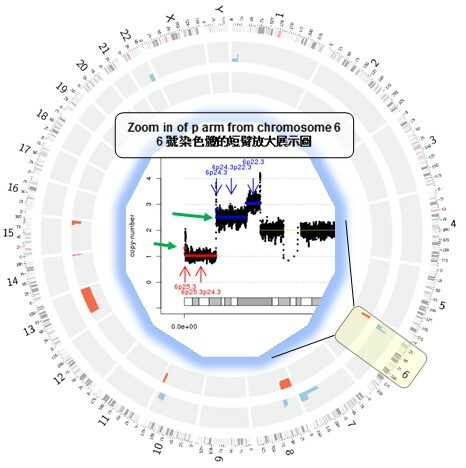 Zoom-in figure of chromosome 6 (shown in inner circle) demonstrates the feasibility of detecting constitutional and mosaic deletion/duplication (shown with green arrows).